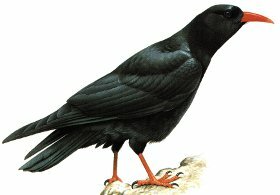 The Chough is a Jackdaw sized bird, with glossy black body and bright red curved bill, it's legs are red and it's wings are square and Raven like in flight. Resident breeding bird in very localised areas on the West coast of Wales, Ireland and Cornwall (around 300 pair) Elsewhere in Europe it can be found in France, Italy and the Balkans. In the UK the Chough frequents coastal cliffs with short cropped grass, in Europe it's habitat is primarily Apline and high altitude pasture. The Chough is now returning to many parts of the UK after becoming almost completely absent, it requires very short cropped grass in order to feed and many locations are now being managed by heavy grazing with goats and sheep. 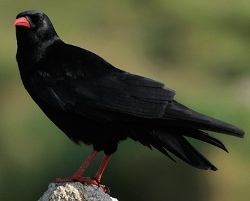 The Chough is the national bird of Cornwall where it has only recently returned after many years. This image captures the glossy black of this adult bird. The legs and curved bill are bright red. Note: Juvenile birds have a more orange paler bill than the adults. 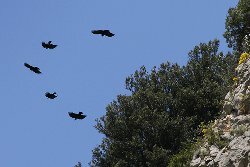 A typical view of Choughs soaring and diving in small acrobatic flocks around cliffs.